San Jose Museum of Quilts & Textiles (SJMQT) announced today that it will showcase an innovative array of exhibitions and events. SJMQT will be displaying Excellence in Fibers (in collaboration with Fiber Art Now Magazine), Suture and Stitch: Mark Newport, and Seeing the Threshold: Jayoung Yoon through January 13, 2019. Miriam at MoMA: Miriam Nathan-Roberts, Public and Personal is on view in the Porcella Gallery through November 25, 2018 and Hey, Are you Free? by Wu Yu Jung is on view November 28, 2018- January 13, 2019. San Jose Museum of Quilts & Textiles (SJMQT) announced today that it will unroll a trailblazing array of exhibitions and events intended to spark dialogue in relation to the complicated and multifaceted topic of gun violence in America. SJMQT will be displaying the exhibitions Guns: Loaded Conversations (in collaboration with Studio Art Quilt Associates) and Generation of Change: A Movement, Not a Moment (from the East Bay-based Social Justice Sewing Academy), with an Opening Reception from 3:00 p.m. – 5:00 p.m. on Sunday, April 22, 2018. The exhibitions will be on display through July 15, 2018. Co-curated by Studio Art Quilt Associates juror Vicky Clark and SJMQT Curator of Exhibitions, Amy DiPlacido, the exhibition presents a powerful display of art works and related in-gallery programming, intended to promote conversation, understanding and reflection on gun issues facing this country. Guns: Loaded Conversations is supported by theprestigious X Factor Arts Grant from SV Creates. Director Nancy Bavor is interviewed by online news platform, NewsUp Now. The platform has produced a series of videos for the SJ Office of Cultural Affairs on public art, showcasing downtown museums and their role in creating a vibrant downtown. 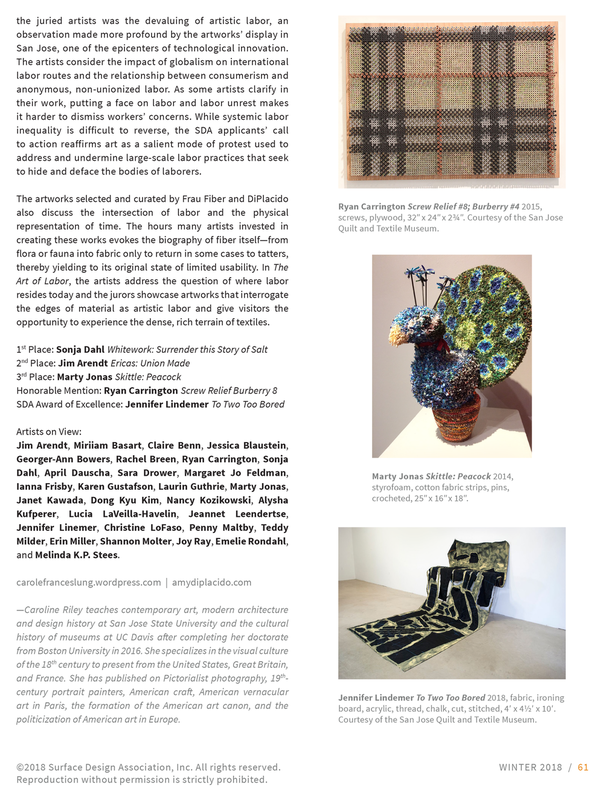 Camille Miller features SJMQT's current exhibitions— 13th Quilt Nihon, Linear Intervention, and Bold Statements in Silicon Valley arts & culture magazine, Metroactive. Read the full article here. Sal Pizarro features SJMQT's 40th Anniversary celebration, "Made in 1977" in the Mercury News. "The San Jose Museum of Quilts and Textiles will be partying like it’s 1977 on Sunday. The gallery, which showcases art that’s more cutting edge than its quaint name implies, is celebrating its 40th anniversary with a community open house." Read the whole article here. SJMQT's special mention in VIA Magazine's article "San Jose's New Spark." Rebecca Smith Hurd mentions SJMQT's important presence in San Jose culture and in the thriving SoFA District of downtown San Jose. The Lia Cook and The California Art Quilt Revolution exhibits are also described in the Spring 2017 issue of VIA Magazine. Two SJMQT exhibits were covered in the News & Inspiration section, Cerebral Touch: Lia Cook 1980-Now and Embedded Pattern: Three Approaches Deborah Corsini, Alex Friedman, and Michael Rohde, in the Spring 2017 edition of Shuttle Spindle & Dyepot.